On September 30, 2012 John MacDonald led members of the Mount Hope Breithaupt Park community on a "culture walk" to discuss the implications of the Weber Street widening. This walk was a result of our neighbourhood winning a "cultural" prize at a Festival of Neighbourhoods event a few years ago. The MHBPNA would like to thank John for his time. We appreciate his insight into how neighbourhoods work and the many questions he encouraged us to consider about our area. We met at Lippert Park and talked about some of the issues around what builds a community and the different types of streets and traffic movement that can encourage or discourage people talking to each other and interacting. John asked us to talk about our patterns of walking, biking and driving and it became clear that Weber street is a dividing line within our rather large neighbourhood. There is a "Mount Hope" side and a "Breithaupt Park" side but many people cross this divide to attend school, walk to Central Fresh Market to shop, or walk or drive over to the Breithaupt Centre. After discussing some of the general traffic patterns through our neighbourhood we walked over to the west side of the Wilhelm and Weber intersection (The MHBP Blog recognizes that using words like "west" and "north" in the Kitchener/Waterloo area is controversial, but we will use them anyway!). It quickly became clear this intersection is a "hot spot" for problems with the widening. In the short time we were talking more than a dozen people crossed Weber street including two people in wheelchairs! 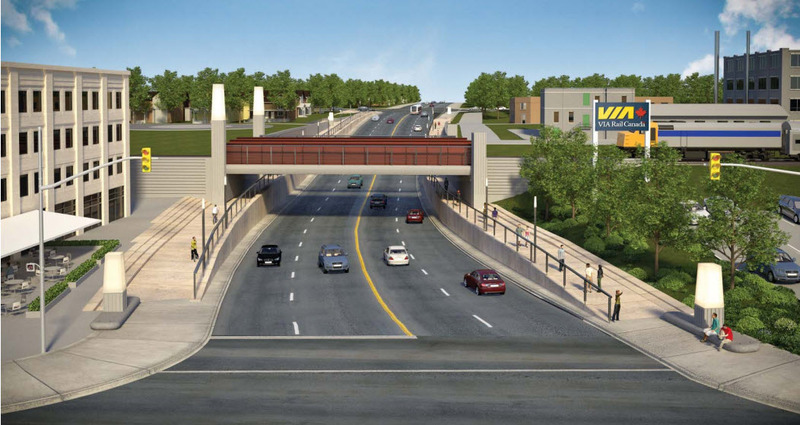 As far as we know, the plan is to have Weber Street expanded to four lanes with no additional crossing lights from Victoria to Guelph streets. Yet we know children cross this street every day to attend KCI or Margaret Avenue schools and many others cross for different reasons. We all agreed that we needed an additional crossing, perhaps with a light. Councillor Dan Glenn-Graham attended our walk and said he would discuss this issue with council. 1) What happens to Lippert Park when the road is widened? Apparently it will become a bit larger but it would be nice to have some influence on what gets added. We would like it to be attractive and invite people from both sides of Weber to use it, in spite of the busy street right next to it. 2) The used car dealership on the right will be torn down and Weber street will be straightened so Lippert Park will gain some land. But there will be a strip of land (where the car dealership presently sits) between the road and the train tracks. What will this land look like? Will be be a park (or "parkette") with grass and flowers? Or will it be a vacant "no man's land" with discarded coffee cups? There will also be a bike trail along the present railway tracks which will end around the new railway bridge to be built over Weber. The Mount Hope - Breithaupt Park Neighbourhood Association is committed to finding out more about the widening which will have a huge impact on our area for many generations to come. 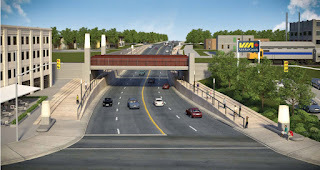 We would like to have input into traffic calming, street crossings, making the railway bridge area inviting and "pedestrian and bike friendly" and many other things. There are lots of questions with few answers so we hope to sponsor an information session in the near future. Stay tuned to this Blog! As a result of this culture walk we will be having a meeting with our councillor, Dan Glenn-Graham, at Lippert Park, Wednesday 5:30 pm. There will also be people from the city there to answer questions about the widening. Central Art Walk this weekend!